pRICE's thread on the most beautiful Mac tower got me thinking about my Mac lineage. I hardly remember what I had and when I had it, but thinking back from current, I came up with the following list. I'm sure I'm forgetting something in the middle era. Actually, Wikipedia has a good history of each major Mac line (not to mention the mac OS lines); worth searching and reading through each for a little backstory & history. Edited 2 time(s). Last edit at 07/12/2018 01:49PM by Zoidberg. Apple IIe doesn't count, does it… ??? 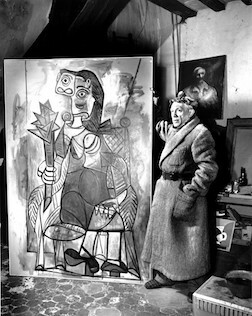 Picasso in his studio after the liberation of Paris, taken by my friend and mentor. there... that's the last time I do this. For a while there I was learning ebay while replacing my computers for profit once or twice a year. But I've lost the need to be on the cutting edge - my computers are just tools now. Apple IIe damn well better count. I bought one new in 1982. Used that machine and a Okidata printer to assemble my business tax documents for 18 years. Great machine. Turned it and the Power Center in for recycling in 2008. 2009 mini - gave to same daughter in 2012 - suddenly all of my Windows problems disappeared. 2014 mini - wife now using this when 2007 HD died. Now you might understand why APPL has done so well. Mr. Curmudgeon, on several OSes and an ego trip. IIci - paid extra for 100M drive, tee hee hee. all I need to know I learnt from Bugs Bunny on Saturday mornings. Television is a medium because it is neither rare nor well done. Edited 2 time(s). Last edit at 07/11/2018 07:11PM by Fritz. No kidding on that Coleco. I got through a few years of college using its daisy-wheel printer and crappy word processing software. After it went belly-up, I tried using the Commodore 128 but printing was near impossible. So I got a hold of a surplus IBM Selectric (sp?) for manual typing and eventually bought a Smith Corona PWP-3 after my Dad's company needed the typewriter back. That Smith Corona was a monster but it was portable for the era, and got me through the rest of college. Think this was the correct model number. First Mac I had with a CD-Rom drive. All of them increased productivity. All of them wonderful in their ways. Mac SE Dual 800k First Mac bought it in college. Duo 210/230/2300 I loved being able to dock up! MB Air Early 2015 with Henge Dock It is almost like having my old Duo back! Santa Rosa MacBook Pro 15"
I won't even bother trying to remember all the PC's ... there were various systems from early Pentiums to Core i7's, probably close to 20. Skill without imagination is craftsmanship. Imagination without skill is Modern Art. Edited 1 time(s). Last edit at 07/12/2018 01:13PM by timg. To the best of my recollection, these are all the Macs I've personally owned in order from newest to oldest. The last two are technically clones, but they ran the Mac OS—version 8, I think. OY I feel so frugal! ... and a crapload of Hackintoshes, plus a few minis for HTPCs and such since then. Edited 3 time(s). Last edit at 07/12/2018 06:44AM by Will Collier. MacII (built from a nicer scrapheap!) - traded in for a IIfx for a friend. PowerComputing Tower and PowerBook 190 (desktop/mobile combo). Replaced Lombard with the Apple Pismo tradein for the PowerBook 190 - best deal ever. Lombard moved on to wife. PowerComputing Tower ended up on the shelf; Pismo was main machine. TiPB failed (hinge and screen); replaced with PB17 (one of my favorite Macs of all time). PB17 went to a 6'6" colleague - he loved a machine that fit on his lap! MBP15 (original)- machine is still in daily use. Ran super hot! Not a good laptop... Did I say it's still in daily use (just not as a mobile machine). MBP15 (Santa Rose) - used for years, first SSD machine. Ended up with 3 Mobo failures; last beyond Apple extended warranty. Parted out. Replaced battery at least 3 times. MBPR15 (first gen) - on 3rd Mobo but is working. Still used daily but not as main machine. MBPR13 (2016) - current main machine. The list would just be a copy and paste from EveryMac. I've owned one of everything at one point or another from the G3 iMac through the current MacBook Pro. Only thing I've never owned is a trash can Mac Pro and the new MacBook. only the iMac and Air are in active use. The G4 iBook and C2D MacBook are gathering dust. The rest are gone, gone, gone baby gone. Edited 1 time(s). Last edit at 07/11/2018 10:39PM by zachdog. 512ke with a 20 meg external hard drive and later upgraded with a 20 meg Hyperdrive scavenged from a free Plus. Edited 1 time(s). Last edit at 07/11/2018 11:21PM by btfc. Edited 1 time(s). Last edit at 07/12/2018 08:23AM by TLB. - Topped off to 72MB RAM, and eventually got a 240MHz G3 in there but there was not much else you could do with that box. - Upgraded out the nose, in the end it had a G4/400, 768MB RAM, Firewire 400/USB card, 10/100 Ethernet card, and an ATI xClaim VR 128 video capture card w/TV tuner! Not to mention as many hard drives as I could stuff in the case after swapping in the rev. C ROM chip from a newer G3 tower. - Got that for free, was fun to play Mario Teaches typing on. Macintosh Plus (maybe an SE ?) got it for free from a family friend, with the Apache Strike game still working in the disc drive! It's all sitting in the box at my parents house. - Got this one for free and used it as a software router with IPNetRouter for our DSL connection. Just got rid of it last month. My latest computer at home is a Hackintosh, so not really a Mac. I use my work computers more than it though. Edited 1 time(s). Last edit at 07/12/2018 09:15PM by pRICE cUBE. Plus sundry Powerbooks and Macs for family, fun & profit. Edited 1 time(s). Last edit at 07/12/2018 10:42AM by Acer. We're going to other computers ? I think the first one I used was a Control Data mainframe at Amherst College in 1966. I was 7. It was super cool ! Then an HP mainframe at the local High school district.. learned BASIC in 1971. For my final project I wrote a flight simulator. Learned the physics around flight so I could code it all, none of this "Import flight library" crap. After that accessing the mainframe at the local community college to play Star trek on a KSR-33 teletype.... Photon Torpedo ! A Data General minicomputer at McDonnel Douglass. It would reset if you touched the case with static built up on your body... classic bad EMI design. Then my first 'personal computer', a home built 6800 processor computer in 1974 with 1 KBits of RAM, baby. I mowed SO many lawns to pay for that. Programmed with switches and the output was blinking lights and data to an RS232 interface. The whole board was wire-wrapped, and... I read the print wrong and wire-wrapped it backwards for 10 hours. I then had to pull the whole thing apart and redo it. Woof. All part of a BSA Explorer Computer Engineering post at McDonnell Douglas. Lots of assembler... push and pop on the stack...Unfortunately the power supply I built (hand traced PCB ) b0rked and fried the whole thing a few weeks after I got it running. Which was sad, because by then I was trying to get up enough money to buy a terminal to connect to the beast. Then access to the largest IBM 370 system on the planet at McDonnell Douglas as part of a BSA explorer post. Except.... we, um, wrote FORTRAN IV and IBM JCL code to run prime numbers and forgot to limit runtime and resource uses. It sucked up an entire 8 hours of run time back when they billed $$$ for processor time. Our advisor got fired and a couple of the boys were arrested. I wasn't there that day, so I didn't get busted. Then I wrote a bunch of front end BASIC code for the St Louis Children's Science museum on their little HP mini computers to control how long kids could run game programs like Hunt the Wumpus and Adventure. They loved me for that. Then the IBM 370 system at Mizzou and a PDP-11 at Mizzou. Running lots of FORTRAN IV code to analyze brain CT scans for cancerous structures. I.. um.. crashed the system by using up all the RAM. oops. Also had a side business using the imaging system in the lab to scan in photos and print them on the big chain printer. Poster of your girlfriend ? $10. Paid for a lot of beer that summer. I used some hacking JCL code to steal accounts from some professors because everyone was limited to processing time, and didn't get busted until the summer NSF program was over. The advisor just laughed, and handed me the 'best scam' award. After that the Honeywell mainframe at SLU.. I did a bit of coding in FORTRAN for Prof Mesarovic's Club of Rome study.. Limits of Growth and all that. Then College where I ran into a lot of systems... too many. Learned to write ALGOL, PASCAL, APL (which was very weird), COBOL, lots of FORTRAN 77, lots of assembler. several iMac G4’s (15” & 17”) used as photoframes. Nobody else here had a Quadra 840AV? I had a Quadra 800 on (actually under) my desk at Apple, 1993. Man I loved that computer. I've had a few others as secondary machines (including the one I'm typing on now, 2011 2.3 i5 Mini) but there are too many to list here as many of these were hand me downs when they became too old for the original owners. For $20 and a swab from your latest, we'll tell you your entire Mac heritage. I expect I may need to move beyond this old 4,1. More and more, it’s having trouble even with web browsing. Curse you, Apple, for making me hate and fear OS updates. I didn't have an 840AV, but did have a 660AV. It's 25 years old this year, and plugged it in a few months ago. It worked for about an hour. I tried it the next day and it wouldn't boot off the internal drive. I popped the cover and noticed leaky capacitors - so it's waiting to be recapped. As with many, not sure I have a full list. - Got in graduate school with student discount. Idiot school IT department stamped the top of it with a branding iron "Property of (university) until:" then used a scriber to scrawl in a date. I suppose intended to discourage students from selling. External drive got upgraded to 1.2 MB, but the internal is still 800 KB. Not sure why I didn't upgrade it to a Mac Plus, which was an option at one point. - Same as Quadra 605, but came with a monitor and a bunch of consumer software. Got a lot of work done on that Mac. Had two, one at work, and one at home. - It ran on 12v, and I rigged up two 4-cell D battery holders and a plug, inside of a zippered nylon bag, to use on airplanes. Probably would drive TSA nuts today. Solid machine. - Overclocked it to 300 MHz. Pretty sure I added a USB card and a FireWire card. Sort of a jack of all trades, as it did both SCSI and ATA/IDE interfaces, had ADB for the keyboard and mouse, and Apple Serial, but could support USB and FireWire via the add on cards. My older kids remember playing all sorts of games on this, especially the Pajama Sam games. Also had two of these, one at work and one at home. - Thing was so slow that I didn't use it much. But the dock was way cool. - This was really my wife's and the family computer. Still great looking. - One of my favorite Macs of all time. This had the early translucent white, vs. the later solid white color. Used these to upgrade Orinoco Silver WiFi cards to Gold, as the Apple AirPort card was an Orinoco card with the antenna cut off. PowerBook G4, 500 MHz, 15" "TiBook"
- Hinges broke eventually, as they all did, then I think the logic board died. Only Mac I've driven into the ground. Was using it with a PC Card WiFi card as they had lousy WiFi antennas. - Upgraded to 1.7 GHz and flashed PC video card. Still hope to set this up again. iMac G4, 1 GHz, 15"
- Wife won this at an a new OS party at the local Apple Store, which must have been for either 10.2 or 10.3. Think I replaced the CD/DVD drive. Still have a memory stick I didn't install because you had to almost totally disassemble the machine to get to the last slot. Required a "carrier" to accept an AirPort card. PowerBook G4, 1.5 GHz, 12"
- Hand me down from my mother when she got an iMac. My favorite Mac of all time. Still making keying mistakes on the Unibody MacBook Pros that I didn't on the PowerBook's great keyboard. Upgraded with an OWC SSD, which made it MUCH faster. Couldn't get a decent replacement battery, however. Only stopped using it when the TenFourFox web browser got too slow. - Hand me down from my niece. Last fully upgradeable MacBook Pro. Has USB 3.0, but only 802.11n WiFi. Eventual upgrade from my 2010 MBP. Lest anyone think the family now only lives on hand me downs, my wife and kids have MacBook Airs, and the wife has a nice 21" iMac, all bought new. But, hey, I'm happy with an upgradeable 8 year old Mac!